Sissy's new friend "R" has an egg allergy. She can't even eat eggs in baked breads. It's pretty severe. We went over to their house for supper and I took Vegan Vanilla Cupcakes. "R" and her older sister "K" could not believe they were eggless. Their momma, Deanna, was super impressed and even more impressed when I told her how easy they were to bake. She said "R" usually eats Oreo cookies since they are without eggs, so cupcakes were a real treat. I didn't even know Oreo cookies were eggless. But it goes to show, when you have a food allergy in your family, you scour the labels to find foods your kiddos can eat without swelling up like a balloon or worse. Deanna recently told me the girls wouldn't eat anything other than the cupcakes for breakfast the next morning. She said they have a really hard time with breakfast ideas, finding foods without eggs (other than cereal and oatmeal) for "R" to eat. I like a challenge! So I started researching blogs for more "eggless" dishes, mainly for breakfast since that's their trouble meal. That's when I found this yummy Pumpkin Butter Pancake recipe. Since pumpkin butter isn't really something we can find at the local grocery store, I thought it might be worth trying with applesauce. It reminds me of my Homemade Pancakes, only this one doesn't have eggs. I like the concept of the Pumpkin Butter and will try this recipe in the future with Apple Butter or even Peach Butter. In a large mixing bowl, whisk flour, sugar, baking powder, baking soda, cinnamon and salt. Make a well and add apple butter, milk, water, oil and vanilla extract. Whisk to combine, add more milk or water if too thick. Allow batter to rest for 5-10 minutes while the skillet preheats. Use a 1/3 cup measuring cup and scoop evenly into skillet. Flip the pancake when bubbles form over the top and the edges look dry. Enjoy with your favorite syrup, honey, powdered sugar or more apple butter. 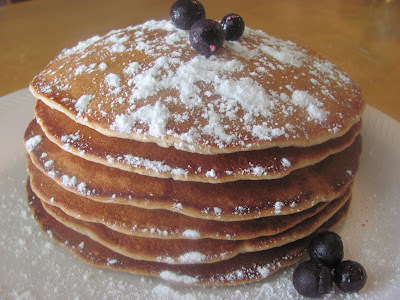 I think if you are vegan and truly craving pancakes this is a pretty good recipe to try. However, I thought the pancakes came out a little "gummy". Maybe it was because I used applesauce. I intend on trying this again with one of the butters to see if that affects the consistency. Your applesauce pancakes look delicious! You know how you said they were a bit gummy - perhaps reducing some of the liquid (milk or water) instead of changing the apple butter/sauce might help? They sure sound good anyway!! Candi, I have looked all over for your email addy so I can send you emails about the Shred, but I can't find it. I'd love to check in on your progress...email me at aliciashomemaking (at) gmail (dot) com if you're up for that! Wow! What a great recipe for those who normally can't eat pancakes!!!! Those look really yummy! What a great recipe. It's hard to find good recipes that accomodate special diets. This one looks like a keeper. I've got a dear friend whose kids are allergic to a whole list of foods. It's so hard for them to eat outside the home :( Thank you for sharing this recipe with Hearth and Soul. I know that a lot of people with food sensitivities are looking for these types of recipes. These pancakes sounds fabulous!! Definitely love that flavor doesn't have to be compromised due to diet restrictions! =) Thanks so much for sharing this with the hns hop! What a wonderful thing to do for that child and her mother. These sound delicious! Thanks for linking this to hearth and soul! Candi, you are so kind to find things for this little darling to eat! I wonder what part of the egg R is allergic too? Sometimes, it is the egg white only and you can still use the yolks. She should ask the doctor what part it is. I know folks who cant take the albumen in the white but wash the yolks in warm water and then drain the yellow into a bowl to use.